Designed on a computer in Japan, harnessing complex physical forces, and rumored to be unhittable, the 'gyroball' could change the game of baseball -- if it exists, that is. Left: Diasuke Matsuzaka, a pitcher for the Seibu Lions. Matsuzaka is said to throw the gyroball, but asked about the pitch at the World Baseball Classic, he admitted only to throwing it occasionally and "sometimes accidentally." 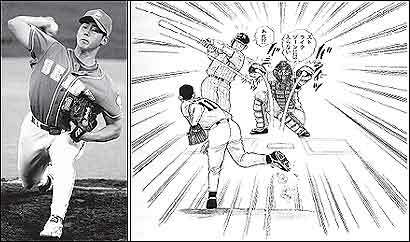 Right: An Illustration from "The Secret of the Miracle Pitch," by Ryutaro Himeno, the Japanese physicist said to have invented the gyroball. Once upon a time -- just a few years ago, actually -- there lived in a small town called Oldenburg, Ind., a kid named Joey Niezer, the ace of his high school baseball team. Twisting his hips and forearm simultaneously, Niezer could throw a pitch that, at least at first, seemed entirely unremarkable. But at the last moment -- that all-important moment when a batter would reach out and take a swipe at it -- the pitch would dive across home plate, as if landing in some invisible groove. Or at least that's what the pitch was supposed to have done -- very few people have actually seen it. A video purporting to show Niezer throwing the pitch has surfaced on the Web, but the Zapruder-esque quality of the footage makes it inconclusive: Jerkily shot from behind the disorienting frames of a chain-link fence, the clip, to the skeptical eye, seems to show little more than a decent slider. Yet together with a few other pieces of similarly suspect evidence, the Niezer video has created something of a low-level craze among a subset of baseball fanatics. The pitch Niezer is supposedly throwing is a gyroball: a pitch that, according to true believers, harnesses different physical forces than any other pitch currently thrown, at least in this country. To hear the gyroball's devotees tell it, the pitch might very well change the game of baseball, swinging the balance of power back in favor of the pitcher as the steroid-infused long-ball era draws to a close. But you have to use a lot of ``ifs" and ``mights" when discussing the gyroball -- it's hard to say anything certain about it. At least, I don't feel comfortable doing so, and I've been on the trail of the pitch for weeks now. I spoke with Will Carroll, a writer for Baseball Prospectus (a must-read in many of baseball's front offices) and a sometime pitching tutor, who says he's the one who taught Joey Niezer to throw the gyroball. I tracked down Ryutaro Himeno, the Japanese physicist who is said to have invented the gyroball using computer modeling. And I spoke to Robert Kemp Adair, the Yale physics professor who literally wrote the book on the physics of baseball (it's called ``The Physics of Baseball"). He deemed talk of the pitch ``hogwash." He may be right. Thus far in its history, the gyroball seems to have been more effective in inspiring imaginative flights of fancy than in seducing batters to swing through its bottom. Yet like any mythic beast worth its salt, it has left behind just enough tantalizing, inconclusive footprints to keep hope alive. And the prospect, however unlikely, of a new way of getting a ball past a batter is just the kind of thing to keep baseball fanatics up at night, dreaming on how the gyroball might be the biggest thing since Bruce Sutter brought the splitter into fashion back in the disco era. Myths are generally deflated by advances in science and technology, but the myth of the gyroball actually owes its existence to scientific experimentation. Himeno, the Japanese physicist, says he started using a computer to analyze how pitches move through the air. ``It was kind of a hobby," he told me over the phone. Eventually, he started using the program he had developed to dissect pitches in an effort to invent a new one. He presented his findings at a research workshop, acknowledging he had no idea if the pitch could be thrown. ``At the workshop I met Kazushi Tezuka -- he is a baseball trainer," says Himeno. ``After he saw my presentation, he contacted me to do joint work." Together, they figured out the athletic mechanics that could produce Himeno's hypothetical pitch. In 2001, they published their findings in a book titled ``The Secret of the Miracle Pitch." According to Himeno, a gyroball will head toward home plate looking like a fastball before breaking straight down as it crosses the plate. He described to me a pitch that would work differently than a traditional breaking pitch, spinning, as best I could understand it, more like a Tom Brady spiral than a Curt Schilling splitter. So what causes the break? ``Simply gravity and the drag force caused by the ball itself," Himeno says. When I relayed this description to Robert Kemp Adair, the Yale physicist, he was perplexed. ``It's not easy to throw a ball that way. May be impossible," he said. ``But there's also no point." ``Throwing a baseball in a spiral wouldn't affect its trajectory," Adair went on. ``There's some difference in terms of how far down a spiraling ball would break, but it's a trivial effect compared to the spin of a normal curveball." Perhaps something had been lost in translation. Himeno is adamant the pitch works -- and he cites as proof the fact that Japanese players have been throwing it now for several years. Himeno told me that Daisuke Matsuzaka, the star of the Seibu Lions, and a pitcher the Yankees are supposedly interested in, throws the pitch. According to Himeno, much of his success is due ``to his mastery of the gyroball." It's true that the few times the gyroball has shown up in the American press it has tended to be in articles in the New York papers touting Matsuzaka as a future Yankee. But such reporting has, if anything, only further muddied the issue. ``He is one of Japan's top pitchers, with a fastball that is clocked around 94 mph and a tight, late-breaking curveball," the New York Daily News noted in March. ``He also throws a mysterious 'gyro-ball,' a pitch that allegedly breaks twice, but he's told Japanese reporters he's never thrown it in competition." Presumably, the chance to see Matsuzaka up close should have solved the mystery. Matsuzaka was, after all, responsible for three of Japan's five wins in this spring's inaugural World Baseball Classic, including the team's victory in the championship game in San Diego. But he seems to have stuck to his more traditional stuff while in the States. When asked about the gyroball by Jeff Passan, the national baseball writer for Yahoo! Sports, Matsuzaka's answer was coy. ``Oh, yes. I'm trying to throw it," he said through a translator. ``I have done it in a game. But not too much. Sometimes accidentally." ``The Secret of the Miracle Pitch" has never been translated into English, and given all the confusion surrounding the pitch, it's perhaps apt that the man who has championed it in the States doesn't speak Japanese. Yet Will Carroll managed to procure a copy of the book, and though he couldn't read it, he deciphered the book's myriad illustrations and drawings, and fashioned himself as something of a gyroball guru. Talking to Carroll about the gyroball is, I imagine, similar to talking to someone who's seen a UFO. Both are sure they've seen something, though neither can precisely articulate what it is they saw. And both realize on some level that there's a good chance no one will buy a word they're saying. He readily admits that he ``can't really explain why" the gyroball moves as much as it does and that he's ``never seen it thrown perfectly." Yet Carroll is responsible for generating much of the buzz around the pitch in America. In 2004, he authored a post on the blog of Rob Neyer, the respected ESPN baseball writer, extolling the virtues of the pitch. And, of course, he taught Niezer to throw it. Carroll says he taught Niezer to throw the pitch in high school, and the results could be amazing to behold. ``Once I saw a batter bend back to avoid it coming in -- then it broke and he had to bend forward. It looked like [the batter] was in a hula hoop. And it was a strike." Of course, it should be noted that something seems to have been lost in the translation here, too. The pitch Carroll describes has a decidedly different movement than the one Himeno told me about -- Carroll's moves horizontally, Himeno's vertically. Asked about Carroll's pitch, Himeno acknowledged that there is a variation with more of a horizontal break. So was Niezer throwing the gyroball, its cousin, or just a filthy slider? Hard to say. Carroll is the first to admit that Niezer never really cottoned to the pitch. ``Joey didn't throw the pitch that much," Carroll says. ``He never got comfortable with it." Attempts to reach Niezer, who is currently a sophomore at Wabash College, failed. But according to the college website, he was the owner of an 0-2 record last season, with a bloated 7.43 ERA. If Niezer has a secret weapon in his repertoire, it seems to be a well-kept secret. Lucas Hanft, a writer living in New York, has written for Radar, Salon, and The New York Observer.